Isotech Screw Driven Positioning Tables are flexible positioning systems consisting of highly accurate ball screw drive assembies providing precise linear motion in both horizontal and vertical operation. Isotech Ball Screw Positioning Tables are designed for long service life and have been tested at full capacity for thousands of cycles to ensure trouble free operation. The positioning table housings are cast from rugged yet lightweight aluminum. The drive assembly connects the motor to the table with a highly durable rolled ball or acme screw. 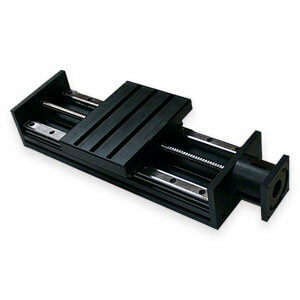 This screw drive design offers superior performance including precise positioning, high moment loads and zero backlash. When selecting a screw table, important specifications to consider include length of travel, rated load, positional accuracy and maximum rated speed. Isotech Positioning Tables feature travel up to 48 in., loads to 2,000 lbs., accuracy to +/- 0.005 and speeds of up to 18 inches per second. Isotech Positioning Tables are available as a single axis solution, assembled for a multitude of X-Y and X-Y-Z positioning duties or as part of a complete mechanical motion system. Many optional features are offered including screw pitch, ball nuts, acme bronze and plastic nuts, preloaded nuts to reduce backlash, custom motor mounting and various rail options for the linear bearing. There are several motor mounting options for Isotech Positioning Tables. Typical mounting consists of an integral motor mount and a motor adapter NEMA 23, 34 or 42. Isotech Positioning Tables are ideal for a wide range of industrial automation applications. There are 5 basic models to choose from. Typical applications include Pick & Place Systems; Cartesian Robotics; Video Production & Automation Systems; Indexing, Sorting & Inspection Systems; Camera Mounts & Scanners; Robotics; Packaging Handlers & Dispensing Systems; Product Lifts, Dumbwaiters & Elevators; Theatrical Automation; Waterjet & Laser Cutting Gantries; and General Automation.